Dreaming of Footpaths: Are The Running Awards & Strava Saving The Bloggers From a Hangover? Are The Running Awards & Strava Saving The Bloggers From a Hangover? So suspecting neither of having read my blog, (in which snacks, poo and hedges feature prominently ... although not at all at the same time) Strava and The Running Awards invited me to go along to the 2016 Running Awards for a Q&A with Tom and Martin of MarathonTalk and a run with Strava. Running I can do, being able to ask a sensible question had yet to be tested but behave myself at an awards do had yet to be proven. However, I accepted all 3 and prepared my best running kit, my most inquisitive questioning voice and my sparkliest dress. 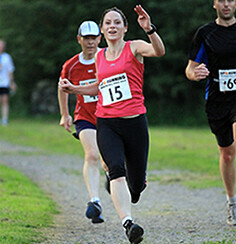 The Running Awards are typically held on the Friday before the London Marathon on the Sunday. No-one is sure why but we suspect it is something to do with stopping all the bloggers who are running the marathon from drinking all the free fizzy, getting horrendous hangovers and spoiling their marathons PB attempts. In actual fact it is probably more to do with the fact that all the brands are at the expo for the London Marathon. But this is the boring explanation so we're ignoring this one and believing in the altruism of the Running Awards instead. Liz Yelling!! Actually ... Liz quite Sedate. After a mad dash around the London Marathon expo, meeting Stewart and going all fan girl over Liz Yelling who handled it beautifully and even signed my London Marathon race number for me, fellow bloggers, Loz and Helen offered me a lift to the hotel where I would be meeting the Strava team. The trip didn't go quite as planned due to roadworks, traffic and a labyrinthine road system but it wasn’t a disaster as I learned some interesting new swearwords from Helen (some of which I will try and insert into future blogs) and I was eventually dropped off on a roundabout in the middle of nowhere (outside hotel). However thanks to my trusty phone and amazing sense of direction (outside hotel), I managed to navigate myself through the scariest parts of London (full of hipsters leaving marketing jobs) and get myself to the hotel. I really do amaze myself sometimes. The hotel was lovely and we were provided a room so we could changed ready for the run with Strava. Apparently bloggers getting changed in hotel lobbies lowers the tone and scares the proper paying guests. Laura of Lazy Girl Running and I were sharing the room and we decided we definitely needed a coffee. However unlike my usual bargain race-hotel rooms, instead of a cup of coffee involving opening a mini coffee sachet and boiling the kettle, in this swanky hotel room we had to use The Most Complicated Coffee Machine Ever. With my prowess with technology (see how to build a turbo trainer) and my Master Builder skill at Lego, I immediately decided I had to be nowhere near The Most Complicated Coffee Machine Ever. Laura however was sucking her teeth and looking at it like a mechanic looks at a car that’s going to cost its owner a lot of money. However, within 3 minutes she had managed to persuade it to provide a steaming cup of coffee and hadn’t even incurred serious burns. I would totally trust her as a running coach. After a hot coffee and after finding the shower cap, robe and slippers we contemplated the rain pouring down the windows and wondered whether we could watch TV for half an hour instead while wearing all of the above but decided that it was time to go and brace ourselves against the torrential liquid British sunshine. Turning up in the hotel lobby, we found there were to be 8 of us in our running group including Dr Juliet McGratten, Jenni from UkRunChat, Laura of Lazy Girl Running, Richard Hayes who is Mohican Runner, Simon from Jographies and 2 very athletic Strava hosts; David and Dan. And me. Disaster on Legs. The run was pitched at a sociable pace so in theory we could chat and run, but the weather had other ideas, attempting to blow our words away and dampen our hair and clothes. Richard Hayes was immediately concerned about his famous vertical hair and the effect the inclement weather would have – possibly a Mohican at a 45 degree angle wouldn’t have quite the same effect. After promising Mohican Runner we would lend him hair straighteners, hairspray and calming his concerns about his hairdo, we set out at a trot. It was nice to come to a hosted run but even better to chat to the other runners and find out what they were up to. Laura was telling us about an ultra in France which ended at the Eiffel Tower and sounded amazing. Richard was saying about how he used to weigh 20 stone – which seems impossible when you look at his athletic frame and his race times. Sharing adventures and being inspired by the stories of others is part of what I find so great about running. I love finding out the stories and motivations of the other runners. Why they do it, what made them start and what keeps them going. Check out this running form! Speedsters! The run took us alongside the Thames and onto a mixture of bricks, trail and quiet roads. In the distance, a bulbous building like a glass bubble was visible next to the Thames. Apparently it housed the start of a path which runs under the river and comes out near Greenwich. We weren’t going this far today but I was determined to explore this at some point. It was a treat to run in London and see the landmarks I usually only see in pictures. We turned off the river path after about a mile and headed inland towards Greenwich Park. Apparently there was a good segment in the park so the lads took off after it and I trailed in their wake until Laura yelled “SARAH! Save your legs for London Marathon!” Gratefully seizing the excuse to slow down and trying not to look as though I was struggling to breathe, I slowly ran up the hill where we all stopped at the vantage point and admired the beautiful view over London. We even managed a group selfie without dropping the camera or a runner off the side of the hill. We trotted back to the hotel, full of chatter. The day was getting colder now and the rain heavier. Despite loving the chat I was looking forward to a hot shower and a leisurely chance to get into the sparkly dress. I managed a quick change Superman would have been proud of. Shower and change into dress managed. Makeup not so much. I crossed my fingers and hoped that the awards do would be dim. I probably had lipstick on my ears and mascara on my hairline. I could always tell people I was going for the Picasso look. We went through Secret Tunnel (it actually had a code name: ‘Direct Walkway’ that’s how secret it was) into the O2 from the hotel and were handed a glass of bubbly and introduced to Tom Williams, Chief operating Officer at parkrun and Martin Yelling, running coach and MarathonTalk co presenter and Simon Klima from Strava. These three were going to be leading the Strava Q&A session and telling us why we should all be using it. I was an easy sale. I was already using Strava and have my local segments staked out. I live in fear of a faster runner spotting them, stealing them and forcing me to reclaim them using a segway, Garmin and my ‘I Am A Strava Wanker’ hat. If you’re not familiar with Strava, it’s basically a social network for people who run, bike or swim. Your activities upload to the site (mine go automatically from my GPS watch) and your friends can see them and comment on them and give you ‘kudos’ – similar to Facebook lilkes. It’s nice to have the positive encouragement and it’s interesting to see other people’s training. There are a few interesting little things with Strava though ... there are ‘segments’ dotted throughout the UK which are sections of road. The fastest runner along these gets a CR (course record) and the fastest cyclist gets a KOM or QOM (King or Queen of the mountain). It also tells you when you get a personal best and tracks your previous activities for you. However, I picked up a few things I didn’t know. Apparently ‘Strava’ means ‘To Strive’ in Swedish. I now know another useful Swedish word along with ‘sauna’ and ‘smorgasbord’. So I can now try, eat and sweat should I find myself in that lovely country. Is ‘Segment’ the same? Apparently the UK is Strava’s most successful country but worldwide there are 5.3 activities uploaded every second (probably half of these by those REALLY keen triathletes I follow – so smug!) and over 1 million photos every week! I know that Strava is a social network for athletes, but those stats astounded me – I had no idea it was that big. I’m all too familiar with the fear when I get a Strava notification, that cold feeling telling you that someone has stolen – I mean I’ve ‘lost’ - my CR or QOM on a particular section of road. But knowing that there are over 150,000 people joining Strava every week, I feel a little bit better knowing that I’m bound to lose a segment every now and then to all these people. Just keep away from my home segments, you FRBs. 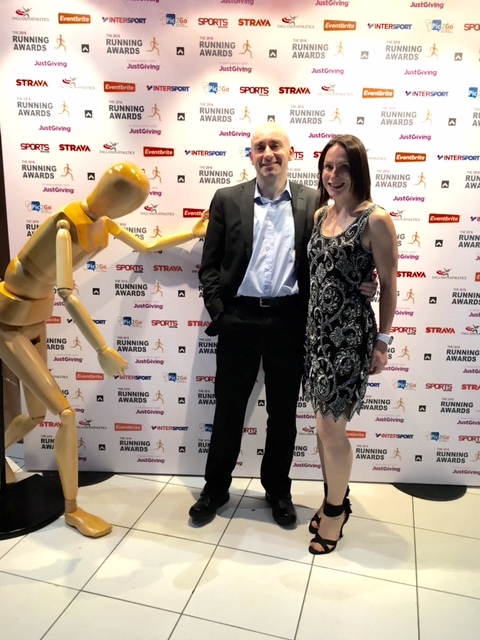 After our chat with Strava, we threw ourselves into the glitz of The Running Awards 2016. As usual, it was a lovely event dotted with familiar names including Julie Creffield of ‘Too Fat to Run’, Susie Chan, Ultra runner and Record holder and the inspiring Shaun, UKRunChat, Equinox 24 and Hope 24 among others. Personally I loved meeting the bloggers and hearing their stories but there were so many deserving nominations and winners. I loved the networking, putting the faces to the names and to the photographs inside the book covers and to the twitter race photos. Hearing about new races and new adventures and best of all being able to talk about running for the WHOLE evening and knowing that everyone else there also loved it as much as me. Interesting strava facts, however, i shall wait for more drinking challenges before I fully commit! That's a good reason to use it! I love the fact I can track my gear however it has 'outed' me as naming my bikes. Apparently 'Daisy' and 'Evie' aren't PROPER names for road bikes. Rubbish. The Whole 30: WHERE'S THE CHEESE? HUH? ?